So far in the top ten divas series, we’ve explored two incredible, iconic voices: Nina Simone, and Janis Joplin. These are women of spirit and soul, who SING through the ages, though they were also known for their leadership and musicianship. The third diva on my list appears not by virtue of her voice, which is lovely enough, but by virtue of being one of the greatest entertainers who has ever lived. Madonna is the reason I first decided I wanted to do music, she is an inspiration. One of the reasons I signed with Starpower Management is that CEO Bruce Edwin was listed on the IMDB for doing publicity for Madonna, which impressed me. In a world where pop stars come and go every few months, where one hundred thirty pounds is considered obese and thirty years old is considered over-the-hill, Madonna has held on to the trim body and appearance of youth, if anything, appearing younger and more beautiful as time passes, while running her career like the seasoned senior executive of a globally recognized brand that she is. She’s always been present, intelligent, and fashionable. Today she defies the odds by continuing to do what she does, showing us that refusal to limit one’s self can trump social bias (in relation to the female double standard and aging). Madonna’s major accomplishments include, among others, eight worldwide concert tours (Who’s That Girl, Blond Ambition, The Girlie Show, Drowned World Tour, Re-Invention World Tour, Confessions Tour, Sticky & Sweet Tour, and The MDNA Tour), a record 156 number-one singles on the Billboard charts (the most for any artist), a Best Actress Golden Globe (for the title role in Evita), critical acclaim for her Broadway debut in David Mamet’s Speed the Plow, and, most recently, receiving the number one spot on Forbes “celebrity money” list in 2013. 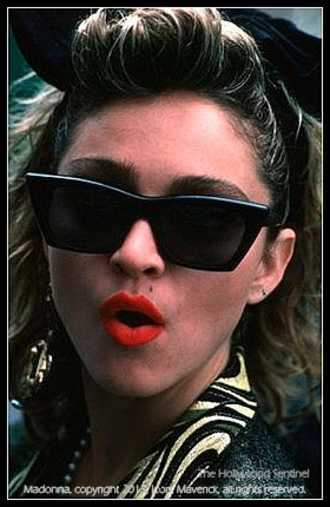 Below follows the “Material Girl,” music video of the hit song performed by Madonna, from the hit album “Like a Virgin,” written by Peter Brown and Robert Ran, (copyright 1986, Sire copyright, 2014, Warner Brothers, all rights reserved). Visit the official Madonna website at www.Madonna.com.